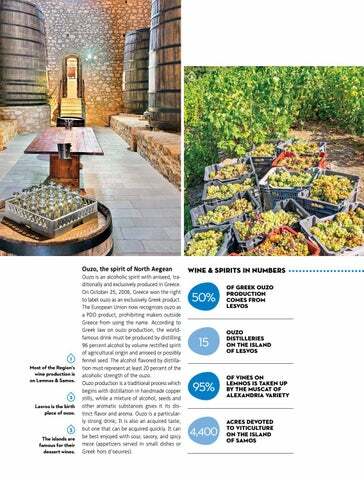 1 Most of the Region's wine production is on Lemnos & Samos. 2 Lesvos is the birth place of ouzo. 3 The islands are famous for their dessert wines. Ouzo is an alcoholic spirit with aniseed, traditionally and exclusively produced in Greece. On October 25, 2006, Greece won the right to label ouzo as an exclusively Greek product. The European Union now recognizes ouzo as a PDO product, prohibiting makers outside Greece from using the name. According to Greek law on ouzo production, the worldfamous drink must be produced by distilling 96 percent alcohol by volume rectified spirit of agricultural origin and aniseed or possibly fennel seed. The alcohol flavored by distillation must represent at least 20 percent of the alcoholic strength of the ouzo. Ouzo production is a traditional process which begins with distillation in handmade copper stills, while a mixture of alcohol, seeds and other aromatic substances gives it its distinct flavor and aroma. Ouzo is a particularly strong drink; It is also an acquired taste, but one that can be acquired quickly. It can be best enjoyed with sour, savory, and spicy meze (appetizers served in small dishes or Greek hors d'oeuvres).